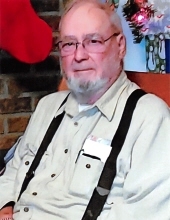 Local businessman, Glenn E. Winters, 88, of Zanesville, left for his heavenly home Thursday, January 17, 2019. He was born July 18, 1930, in Zanesville, a son of the late Orville and Elizabeth (Frick) Winters. Glenn was the former owner-operator of the Zanesville Impliment Company Inc. for sixty-five years. His father, Orville, started the machinery business in 1936. After his death in 1952, Glenn took over as manager until he retired in 2005. Glenn also was an area farmer, on the land that he bought at the age of thirteen, and on the paradise farm he raised Angus cattle. Glenn was a kind and gentle man. He was a member of the Farm Power and Equipment Association where he served as a director, a member of the Zanesville Sertoma Club, Ruritan, and also Immanuel United Church of Christ. He is survived by his wife, Lura K. "Kitty" (Ralph) Winters whom he married August 25, 1982; five sons, Richard (Patty) Winters, Randy Winters, Eric (Samantha) Winters, Glenn Ore and Quint (Alexis) Ore; a daughter Denise (BJ Jones) Winters; seventeen grandchildren, Brian, John, Levi, David, Jimmy, Brandon, Cody, Mikey, Glenn, Watson, Clayton, Andrea, Krissy, Erica, Brandy, Madison, and Kiah; fifteen great-grandchildren; one great-great-grandchild; special friends Tom and Carol Rayner; caregivers, Julie and Cody Ore; and his Wendy's buddies and best friends, Vince and David. In addition to his parents, he was preceded in death by a daughter, Kitty Lynn Ore; a son, William Winters; a grandson, Josh Winters; three sisters, Evelyn (Harry) Rittenberger, Loretta (William) Edwards, and Dorothy Tunis; and a brother-in-law, James Tunis. Friends and family may call from 2-4 and 6-8 P.M. on Monday, January 21, 2019 at the BOLIN-DIERKES FUNERAL HOME, 1271 BLUE AVENUE, ZANESVILLE where funeral services will be held at 11 A.M. on Tuesday, January 22, 2019, with Pastor Mitch Reed officiating. He will be laid to rest at Duncan Falls Cemetery, Duncan Falls. To send a note of condolence, or to order flowers or comfort food: visit www.bolin-dierkesfuneralhome.com , follow us on Facebook, or call our professional staff at (740)452-4551.